Video footage released Wednesday shows a man shot and killed by San Francisco police in a Market Street Subway store last week had attacked and struggled with an employee before officers arrived and opened fire. Christie Smith reports. Video footage released Wednesday shows a man shot and killed by San Francisco police in a Market Street Subway store last week had attacked and struggled with an employee before officers arrived and opened fire. The videos, taken both from body-worn cameras worn by the responding officers and from surveillance cameras inside the store, were released at a town hall meeting on Market Street held to present preliminary information on the May 3 shooting that killed 26-year-old Nicholas Flusche. Police were alerted to the attack at the Subway store at 991 Market St. around 11:15 a.m., when two uniformed officers in the area to investigate an unrelated vandalism report were flagged down, according to Cmdr. Greg McEachern, who heads the department's investigations bureau. The officers found three people in a physical fight behind the counter, with one person stabbing another, McEachern said. The stabbing victim and the other man came out from behind the counter and Flusche allegedly followed after them with a knife in his hand, at which point one officer fired one shot, striking him, McEachern said. Police provided medical aid but Flusche died at the scene. The stabbing victim was treated for stab wounds and bruises to the head but was released from a hospital later that day. 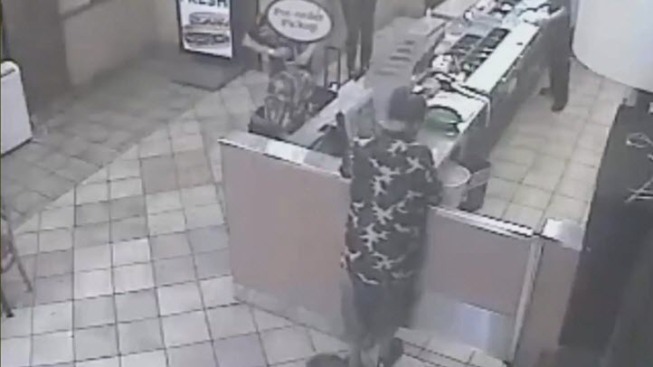 Footage taken from the officers' body-worn cameras shows that the shooting occurred very quickly after police stepped into the store, with Flusche on the floor almost immediately after he follows the other two men out from behind the counter. He was struck once in the lower right back, police said. The footage taken from the store cameras shows a lengthy struggle that occurred after Flusche stepped behind the counter and before police arrived. As he and the employee grappled on the floor, several other people can be seen trying to intervene by hitting Flusche with objects, throwing things at him and distracting him. The third man behind the counter when police arrived appeared to be among those trying to stop the attack. The officer who fired the shot has been identified by police as Officer Kenneth Cha. Cha was also involved in a shooting on Jan. 6 that injured Sean Moore after officers responded to a noise complaint made by Moore's neighbor in the city's Oceanview neighborhood. Moore, who is mentally ill, was unarmed at the time of the shooting. Police and prosecutors have alleged he kicked and punched officers during a struggle, while the public defender's office and advocates have argued he was defending himself against officers who exceeded their duty. A judge last month dismissed most charges against him and prosecutors Wednesday dropped the remaining charges. Police Chief William Scott, who was appointed in late January, said the videos and other information about last week's shooting were being released Wednesday as part the department's commitment to transparency. Scott was careful to avoid commenting on whether the shooting was justified, instead noting that multiple agencies are investigating it, including police, internal affairs, the Office of Citizen Complaints, the district attorney's office and the medical examiner's office. "We want to get it right, we want to be transparent, and we want to report the facts as they are," Scott said. The department is in the midst of implementing a long list of reforms recommended by the U.S. Department of Justice last year in the wake of controversy over a string of police shootings. Scott on Wednesday noted that the department had followed a number of recommendations relating to officer-involved shootings, including implementing a new use of force policy and improving the notification of other investigative agencies. The department will also hold its own firearm discharge review in a more timely manner, rather than waiting until all other investigations are complete, he noted. While past town hall meetings on officer-involved shootings have drawn angry, raucous crowds, today's was quiet and lightly attended. Several speakers expressed suspicion of police and concerns about Cha's record. One speaker, neighborhood resident Jamie DeJesus, said the civilians who had intervened in an effort to distract or dissuade Flusche should be commended by the city. "If they hadn't done that, that person might not be there today," DeJesus said. "They put their lives in harm's way to save someone else that they probably didn't even know."